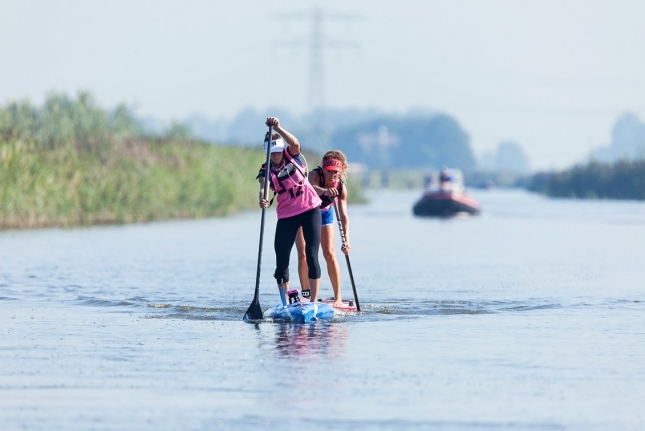 Starboard’s Bruno Hasulyo (Hungary) and Mistral’s Seychelle Hattingh (USA) have conquered “The Ultimate Challenge” after five days and more than 200kms of (125 miles) of paddling through the Dutch countryside, winning the 8th Annual SUP 11 City Tour to add another chapter to the story of this unique and very special race. After establishing a big lead on the first stage, Bruno and his brother Daniel spent the next four days defending their advantage against reigning champ Steeve Teihotaata (Mistral/Tahiti), while Italian Martino Rogai (Jimmy Lewis) and New Zealand’s Marcus Hansen (NSP) were the other top five standouts. Seychelle made it a clean sweep for the second year in a row, claiming all five stage wins to convincingly defend her crown. However the Floridian didn’t have it all her own way this year, with a determined Petronella van Malsen (Fanatic/Netherlands) hanging on to her tail almost the entire week. After 25 hours of racing, Seychelle’s margin was less than six minutes, which shows how much tighter the women’s race was this year (the gap was more than half an hour in 2015). Take a look at our daily recaps below for more insights into this iconic event, including a more detailed summary of the overall race after stage five, along with the final leaderboard and daily highlight reels. Follow the 11 City Tour on Facebook and Instagram for more. On behalf of the paddling community, I’d like to say a big thank you to all the crew behind the SUP 11 City Tour. This event could never happen without the small army of organisers, volunteers and supporters who work tirelessly behind the scenes. 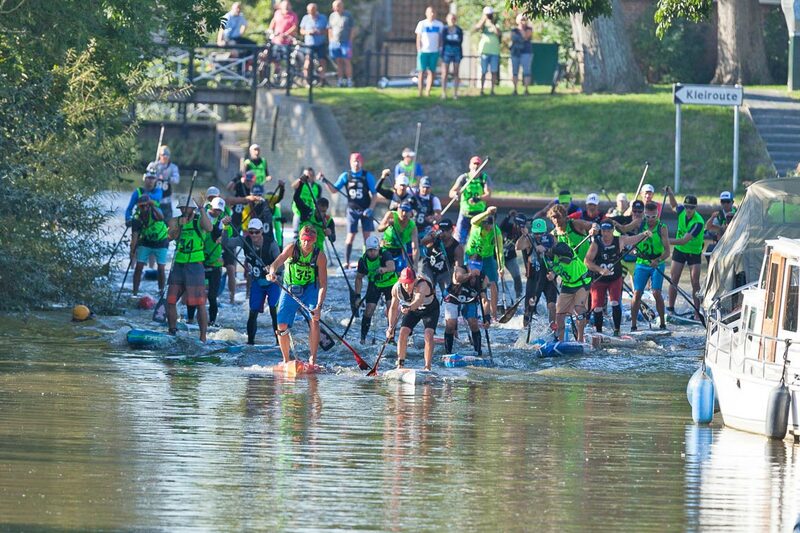 I’m already looking forward to the 9th annual edition next year, which, after this year’s record representation of more than 150 paddlers from 27 nations, will surely be the best Tour yet. 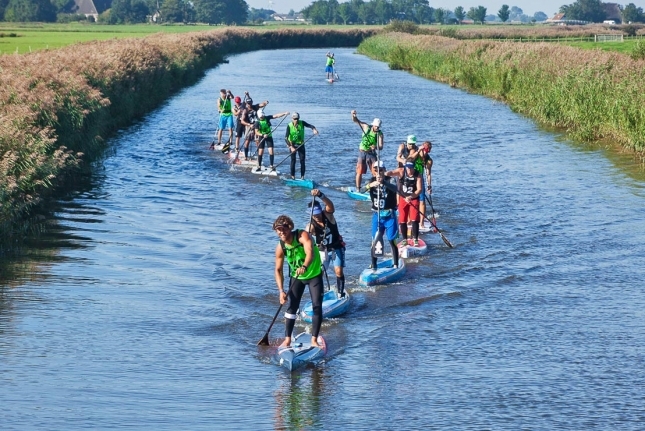 After five days and more than 200kms of paddling through the rural Dutch province of Friesland, the 2016 SUP 11 City Tour is complete. There were no changes to the top of the leaderboard on the final day, with Bruno Hasulyo and Seychelle Hattingh claiming their crowns after crossing the line in Leeuwarden, which is the exact same place they started five days earlier. Seychelle was pushed all the way to the line by Petronella van Malsen once again today, who takes a much deserved runner-up finish on the overall leaderboard. However Seychelle was too strong all week, breaking away towards the end of the first four stages to accumulate a six minute lead. Switzerland’s Siri Schubert was also impressive, finishing less than 15 minutes behind the champ to claim third place overall. Despite the dark horse performances, Seychelle made it a perfect 5-0 sweep of the stage wins for the second year in a row, much to the delight of Team Mistral. The current 24 hour world record holder is making something of a name for herself in the endurance racing world, and will be tough to beat this race in the future as her paddling matures. Seychelle was clearly elated after crossing the line on stage 5, commentating on Instagram that she was “on top of the world” following her successful title defense. On the men’s side, Team Starboard and the Hasulyos performed a perfect lock-out, with Bruno and his brother Daniel Hasulyo claiming every stage win in addition to the overall top two spots. Although they crossed the line together almost every day, Bruno officially won four of the five stages, with Daniel getting a stage win on day two; Bruno’s final winning margin of 17 seconds over his brother came almost entirely on the third stage. This was a hugely well-deserved one-two finish for the Brothers (or SUPBROz as they’re known), who have established themselves as top-level athletes after a string of solid results over the past 12 months. But this week’s effort was their biggest one yet, and comes on the back of months and months of tireless, intense training. Indeed, the Hasulyos have probably been preparing for this moment for exactly 12 months, after finishing 3rd and 4th in last year’s Tour. Although the 11 Cities is a five day event, the race was really won on the first stage, with the Hasulyos gapping Steeve Teihotaata and the other contenders by nine minutes to build a virtually-insurmountable lead. All they had to do for the next four days was defend, which is exactly what they did. The 11 City Tour is famous for the camaraderie between the competitors, however there were several moments of tension at the front of the men’s elite race, with the Hasulyos using the old “rubbing is racing” theme to keep their main rival at bay. Steeve didn’t have much to say about the close attention he was receiving (nothing seems to bother that guy too much, he’s such a laid-back and mellow character), however the Mistral crew didn’t hold back. Team boss Steve West posted a photo sequence on Facebook titled “Hungarian Hospitality in Holland” that included a dig at the seemingly-aggressive tactics the Hasulyos were using to defend their lead. Apparently there was a sit-down between the Mistral and Starboard camps before the fourth stage to hash out a gentleman’s agreement. But despite the interesting rivalry between the two race teams, in the end it was a draw, with Starboard and Mistral each winning five stages between the men’s and women’s elite tours. Further down the leaderboard, it was a great performance from Italian dark horse Martino Rogai, who gave the Jimmy Lewis team a great result in 4th place. Martino, who’s part of the strong new wave of talent coming out of Italy, was just 40 seconds behind Steeve at the end of the week. Rounding out the top five was Marcus Hansen from New Zealand, who gave NSP a new name to watch in addition to their superstar duo (Travis and Titouan). Marcus held pace with Steeve and Marcus on all but one of the stages, and kept up with the Hasulyos for three of the five days. Leading the charge in the bottom half of the top 10 was Tour veteran Martijn van Deth (Starboard), who seemed to get stronger as the week progressed and finished well clear of the other top 10 contenders in 6th place. Those others included Chilean turned Holland local Ricardo Haverschmidt (Fanatic), who worked his way up the leaderboard to 7th, and Spain’s highly under-rated distance paddler Pepe Oltra (SIC), who took 8th place. Pepe was one of the work horses that drove the peleton for much of the week, alongside four-time 11 Cities champion Bart de Zwart, who was two minutes behind the Spaniard by Sunday afternoon. Bart’s 9th place is the lowest result of his 11 City Tour career, which includes all eight editions of the race. That just goes to show how much the level is increasing in an event that is growing to become an iconic race on the international calendar. I talked to Bart mid-week and he told me he felt like he could match the lead group endurance wise, but that he didn’t have the pace to go with them at the start. Indeed, the Hasulyo Brothers set a blistering pace off the line each morning, treating it like a sprint race despite the fact there was five hours of paddling a day. Rounding out the top 10 this year was the unheralded Zoltan Erdelyi (Jimmy Lewis) who, just like the Hasulyo brothers, hails from Hungary, giving the Eastern European nation the equal most spots inside the top 10 alongside the host nation of the Netherlands (Tahiti, Italy, New Zealand, and Spain were the other four nations represented at the top of the men’s leaderboard). There were plenty of great performances all the way down the leaderboard though. And that’s what really makes the 11 City Tour so special: There are dozens of “races within the race” as paddlers try to get the last spot inside the top 15/top 20/top 30, or just try and beat their friends or move one spot higher each day. Some of the stand out stand up performances included young James van Drunen, who was sitting in the overall top 10 after stages 2 and 3, but who hit the wall over the final two days to settle for 14th. That’s a big improvement from the 27th place he got last year though, and is reward for the hard work and dedicated training schedule he had in the lead up to Holland; something that James chronicled via his Instagram. A special mention also goes to Jonas Letieri, the always-smiling Brazilian who has overcome big odds (Jonas is a double-amputee, losing his forearms in an electrical accident at his local church) to compete at some of hte biggest races in the world. 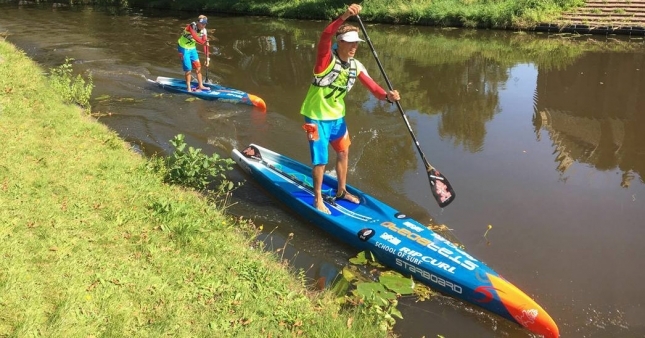 The SUP 11 City Tour was surely his greatest challenge to date, and Jonas conquered it with great success, crossing the line in Leeuwarden alongside compatriots Americo Pinheiro and Clayton Eduardo after 33 hours of paddling that is as much a mental challenge as a physical one. It was an interesting battle for the title of Masters Champion – a new division this year I believe – between Charles Higgins and Tour veteran (and Supskin founder) Wolfgang Leeb. The duo traded the lead all week, before Higgins pulled away on the final stage to win by four minutes. Another special shout out goes to Caren Forbes, who successfully completed the non-competitive “tour division” alongside her brother Todd Philips (below) after almost 37 hours of determined paddling. Anyone who has ever dealt with Starboard HQ will know Caren; she’s the brand’s international marketing manager and team manager. Caren said it was an amazing feeling to complete the epic five day journey, something shared by almost every paddler that takes on the 11 City Tour. For many of the participants, this isn’t really a race at all; it’s an adventure. Apart from the massive achievement of finishing the race herself, will also be stoked that her team riders finished top two in the men’s side, especially because they were riding the new 21.5″ wide Starboard Sprint models that will be part of the 2017 range. Today’s final stage saw the biggest turnout of participants, with many paddlers choosing to do just one stage of the Tour, and most of those choosing the final, 27km route from Dokkum back to the start/finish town of Leeuwarden. It was a very successful year for the Tour, with more than 150 paddlers representing 27 nations, and with beautiful sunshine making it one of the nicest Tours in recent memory (this event has a reputation for encountering some wild weather). Congratulations to Bruno, Seychelle and all the paddlers that conquered the 11 City Tour this year, and a huge thank you to the organising team that works so tirelessly behind the scenes to make this iconic event happen. The 11 Cities is a very special race that has built a unique reputation within the sport, offering “The Ultimate Challenge” as its tagline says. I’m looking forward to the 2017 edition already, where hopefully I’ll be back on the start line alongside the other 11 City Tour die-hards. The final leaderboard is below, while raw times from stage 5 are available on Race Splitter. Quick recap: It was the same story again today, with the Hasulyo Brothers controlling the pace and defending champ Steeve Teihotaata unable to break away and peg back their massive lead. Once again the top five of Daniel and Bruno Hasulyo, Steeve, Marcus Hansen and Martino Rogai crossed the line together. Tour veteran Martijn van continues his impressive run, sticking with the front pack almost all the way to cross less than two minutes behind the leaders. As always, Bart de Zwart and Pepe Oltra led home the peleton, with the top 14 finishers all registering under five hours today. I spoke with Bart yesterday and he said that while he’s a bit frustrated with his relatively poor result, he gave big credit to the Hasulyo Brothers, saying they were clearly better prepared and hungrier to win than anyone. Bart told me he was feeling good, endurance wise, but didn’t have the pace to match the leaders in the opening part of each stage. The four-time 11 Cities champion also suggested that he was perhaps still feeling the effects of the two ultra ultra marathons he recently completed (Bart has paddled 1,280kms of racing in the past two months). The top nine spots on the men’s leaderboard remained the same; It was a tough day on the water for James van Drunen though, the hard training youngster whose progress I’ve been following closely in the lead-up to this event. James who was holding down 10th this morning but slipped to 12th after losing the peleton in today’s stage. On the women’s side, Seychelle Hattingh made it four from four stage wins, however the very impressive Petronella van Malsen stuck with her all the way until the finish today. Seychelle won this race comfortably last year, but the Dutchwoman Petronella, and also Siri Schubert from Switzerland, have given her some very close checking this time around. I heard there was been a bit of tension at the front of the men’s race during the second and third stages, as the brothers aggressively defended their lead and made sure Steeve couldn’t get in a position to make a break. Or rather, there was a bit of tension off the water. Apparently Steeve was fine with the “rubbing is racing” tactics, but his team bosses at Mistral were rather upset at the treatment their star rider was getting. It was spoken about before today’s fourth stage, and now I hear everything’s cool again. 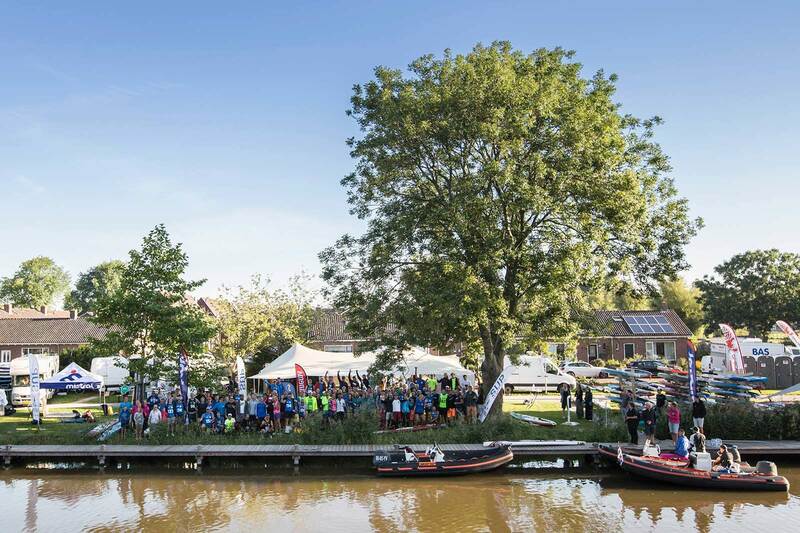 Stage 4 is famous for the hectic start in a narrow canal that forces paddlers to sprint and scramble for clean water. The starts are intense on every stage, but the 4th is a particularly interesting little battle. It always produces some great photos. The stage is also famous (or infamous) for the portage run, where paddlers have to get off their boards, hop out of the canal, run across a “lock” for 50 metres then jump back in and continue paddling. It’s always a mildly chaotic scramble that often breaks up the draft trains. So that’s four out of the five stages completed, with only tomorrow’s 27km “sprint” to the line. The short stage has no rest break, and the pace is always high as competitors throw everything they’ve got left. But it would seem impossible for anyone to catch the Hasulyo Brothers now. The only question left is whether Daniel can make up the 19 seconds that his brother Bruno has over him. Updated leaderboards are below, while the raw times from today are posted over on Race Splitter. Quick update: Stage 3 has just finished. The raw times are posted on posted on Race Splitter, and I’ve just updated the overall leaderboards below. Looks like it was another good day on the water, with the favourites sticking together all the way til the line just like yesterday. After crossing the line together to claim victory on the first two days, Bruno Hasulyo has taken the outright lead from his brother after sprinting away in the final few hundred metres, with Steeve, Daniel and Martino not far behind. Marcus Hansen was dropped from the front pack today, which has seen Martino move up to fourth on the leaderboard. In the women’s, Seychelle Hattingh made it three from three, however once again the impressive duo of Petronella van Malsen and Siri Schubert held on for most of the day, crossing just a couple of minutes behind. It was a beautiful day in Friesland on Thursday, with blue skies and light winds making conditions perfect for racing. Or perhaps a little too perfect, as the draft trains held together strong all the way along the 45.5km (28.3 mile) stage. The top of the leaderboards are unchanged, with the top five guys crossing the line together to keep stage 1’s time gaps in place, however several paddlers further down the order made some moves. Follow the 11 City Tour on Facebook and Instagram for more. Here’s the men’s leaderboard after the first two stages (click here for raw times from stage 2). 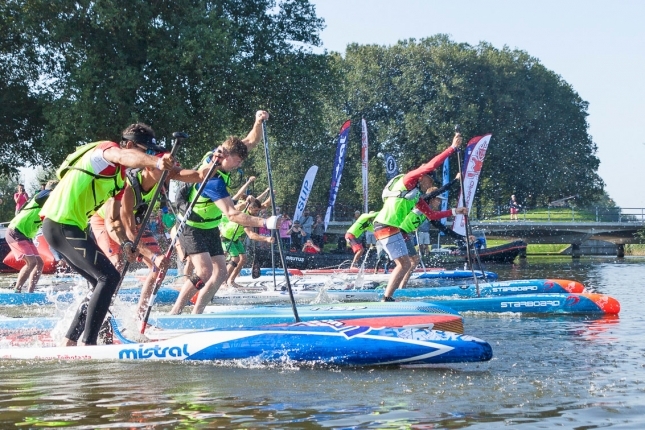 The Hasulyo Brothers, Bruno and Daniel, have opened up a massive advantage on the overall leaderboard after the first stage of the 2016 SUP 11 City Tour in the Netherlands, with the Starboard duo from Hungary finishing almost 10 minutes clear of defending champ Steeve Teihotaata (Mistral/Tahiti), Marcus Hansen (NSP/New Zealand) and Martino Rogai (Jimmy Lewis/Italy). 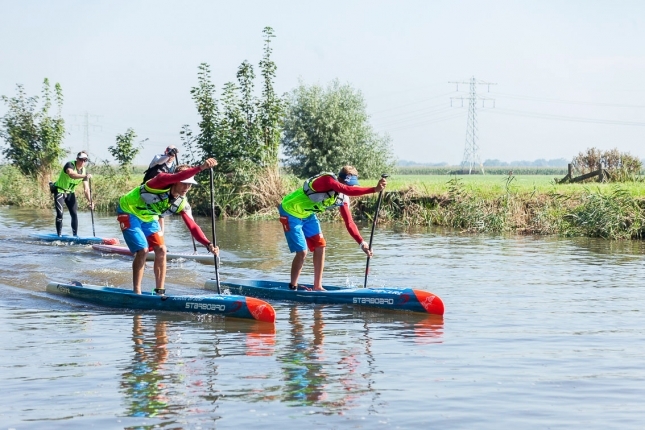 The brothers, or SUPBROz as they’re known, followed the same routine as last year, sprinting away at the start in the town of Leeuwarden to quickly build up a two minute lead over the opening few kilometres. But unlike last year, when Steeve was eventually able to catch and pass them each day, Bruno and Daniel not only maintained their lead but grew it, eventually crossing the line virtually side by side in a time of 4 hours, 43 minutes and 29 seconds. The defending champion fought hard to finish well under five hours, however Steeve’s time of 4:52:58 gives his key rivals a huge head advantage heading into tomorrow’s second stage, where all paddlers will once again have a “mass start” in the morning, with daily times being combined on the Tour de France-style leaderboard. Sticking with the Tahitian today were the impressive debutantes Marcus and Martino, who are now looking odds-on favourites for a top five finish after breaking up the main chase pack in the second half of the race. Crossing the finish line in the small town of Sloten just after 3pm local time was Pepe Oltra from Spain. The highly under-rated competitor from Team SIC was in and out of trains for much of the race, paddling a long stretch on his own before gaining ground towards the finish. In his caption above, Pepe talks about the heat being a big factor today. The Menorcan is looking to improve on his 7th place finish from the 2015 Tour; after teh first stage he’s in 6th place and on track to go one better than last year. Right on his tail at the finish was Chilean turned Dutch local Ricardo Haverschmidt (Fanatic), who is also now one spot higher on the virtual leaderboard after finishing in 8th place 12 months ago. Ricardo was actually ahead in 6th place as he approached the lake at the end of the stage, but was reeled in and eventually overtaken by Pepe before the finish line. Surprisingly, four-time champion Bart de Zwart was another two minutes adrift, crossing in 8th place today to record what is perhaps his lowest single stage result in the eight years he’s been competing in this classic event. Bart is already a massive 22 minutes behind the lead duo, so his goal now will be to push for an individual stage win and get back inside the overall top five. Dutch duo Martijn van Deth (Starboard) and Hub Dekkers (JP Australia) rounded out the top 10 times, while 17-year-old James van Drunen (Spain/AquaInc) was just a couple of minutes outside the elite club. However the youngster, who has been chronicling his dedicated 11 Cities training schedule on Instagram the past couple of months, will have a good chance of cracking the top 10 tomorrow because Dekkers is only doing stages 1, 4 and 5. After finishing 3rd and 4th respectively in last year’s Tour, Bruno and Daniel set a clear goal of finishing first and second in this year’s event, and so far they seem to be well on track to achieve it. The pair, who train harder than any paddlers I’ve ever met, have skipped all the other big international races over the past two months to focus solely on their 11 City Tour mission. Although there are still four days, four stages and 160 odd kilometres of racing left to go, it will take a monumental effort for anyone to reel in the Hasulyos from here. Interestingly, the brothers were paddling the new 21.5 inch wide Starboard Sprint (the new 2017 model). All other things being equal, that would give them a slight improvement in efficiency, which in a race as long as the 11 Cities, can turn into a big improvement on the leaderboard. Bruno and Daniel are hungry competitors. They will want to win every single stage by 10 minutes and make a real statement, which means they will most likely continue to attack the field each morning, just as they did today. However that would leave the door slightly open for Steeve, Marcus and Martino; if the brothers push too hard at the start of one stage, they could potentially hit the wall and give the other guys a chance to strike back. But given the form they’ve shown today, that all seems rather unlikely; Bruno and Daniel will be odds-on favourite to win every stage from here on, with the only real question being which of the two will take the overall title. They were clearly working well as a two-man team today, but I daresay on the final day the sibling rivalry will kick in and they’ll both go for broke. While much of the focus was on the arm-wrestle in the elite men’s field, the women’s race was much close than expected. The 2015 champ Seychelle Hattingh (Mistral/USA), who went five and zip to make it a clean sweep of last year’s event and is a hot favourite to defend her title, took the stage win but received some close checking along the way. Sticking with Seychelle the longest was Dutchwoman Petronella van Malsen (Fanatic), who was only three minutes behind at the finish after sharing the lead with Seychelle early on, while Siri Schubert (AquaInc/Swizertland) is only another minute behind after the first of five stages. Judging by the impressive times of today’s top trio, and considering there’s already a further 16 minutes back to 4th place, the women’s podium is probably already out. Steeve and Seychelle’s Mistral team mate, Jonas Letieri (below), is another one of the many debutantes in this year’s Tour, and the inspirational, every-smiling Brazilian put in a great effort to finish in just over seven hours and take a spot in the middle of the pack. It was a tough day on the water for many, with (I believe) a record amount of competitors taking more than eight hours to reach the finish line. There was a stiff headwind for the final 10kms or so, which would have played havoc with paddlers on the infamous “Slotermeer” lake that creates a physical (and mental) barrier right before the end of stage 1. The competitors will have enjoyed their free massages and meal this afternoon, but will be heading to bed early to get ready for tomorrow morning’s second stage, which is a mammoth 45.5km (28.3 miles) from Sloten to Workum. The weather looks good, with mostly sunny 22°C (72°F) temps forecast for Thursday. However there might be a moderate side-wind in the first half of the course, which could cause some grief on the series of short but exposed lakes that paddlers must navigate in the opening hour of the stage. You can follow the paddlers on the live GPS tracking map, and you can get a better understanding of where in the world this race is happening via the official course map. Also be sure to follow the 11 City Tour on Facebook and Instagram for regular updates throughout the day. We must also give a big shout out to the finishers of the “Non-Stop Tour”, which is exactly what it sounds like: paddling the entire 220km in one non-stop stretch (instead of the usual five days/five stages). All day. All night. It’s an extraordinary challenge of both physical and mental stamina. The non-stop race began Monday morning and finished on Tuesday afternoon. Frenchman Florent Dode, who was the five day runner-up last year, won this year’s non-stop tour in record time. Janneke Smits and Joanne Hamilton-Vale enjoyed a see-sawing battle in the women’s race, with Janneke outlasting Jo after almost 30 hours of paddling.